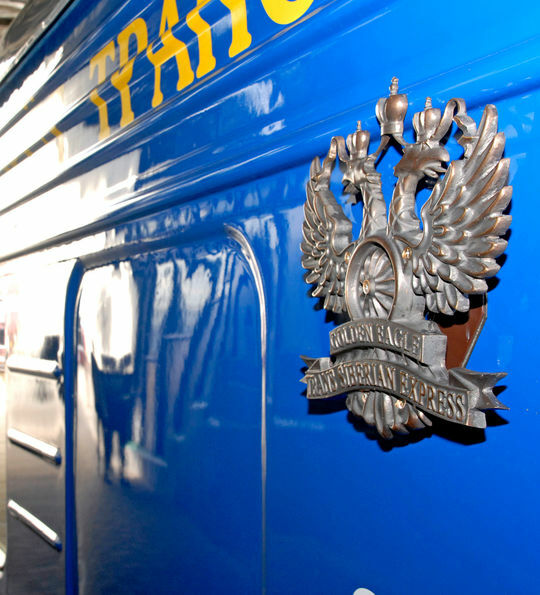 A journey on the iconic Golden Eagle Trans-Siberian Express is one like no other; an exclusive sojourn that brings unprecedented luxury to the world's greatest railway journey. 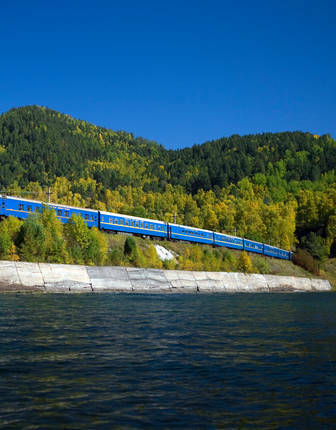 Here, I recount a recent journey I took on the iconic Golden Eagle along the epic and historic Silk Road, an ancient trade network that once connected the East and West, enjoying luxury, adventure, history and everything in between. 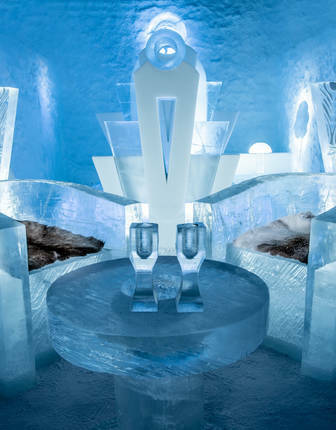 On arrival at Moscow airport, we were met and transferred to the luxurious five-star Marriott Royal Aurora hotel, located in the heart of this vibrant city for a two-night stay. The transfer took almost two hours due to heavy traffic in Moscow, but it was actually a lovely way to enjoy the outskirts and sights of Moscow en route. We took the time to explore the city before enjoying a cocktail party at the hotel, which was extremely well located and in the heart of everything you'd want to see, from the Bolshoi and Drama Theatre to the Old KGB Building. 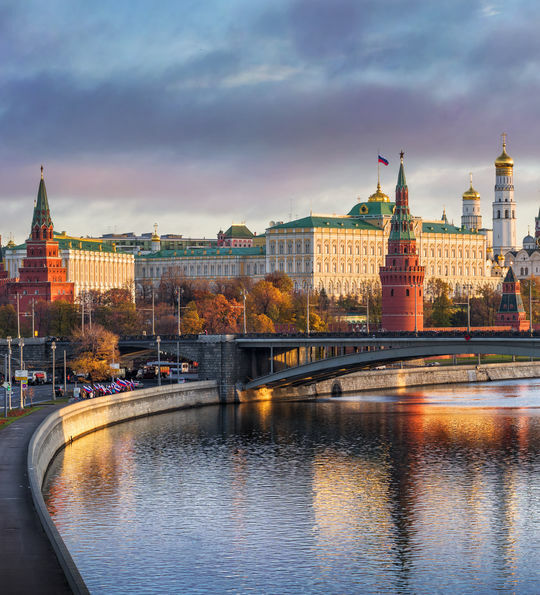 We enjoyed a city tour of Moscow, exploring the famous Kremlin before it was open to the public, going on to visit the surrounding gardens and Red Square, an iconic symbol of Russia's former military and political might. 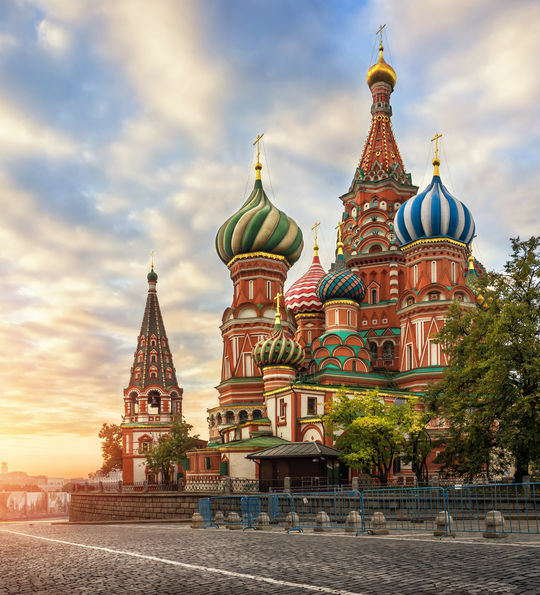 I marvelled at the intricate architecture that appeared round every corner, such as the ornate St Basil's Cathedral with its magnificent onion-domed spires, the grandeur of The Kremlin and the sombre and evocative site of Lenin's tomb. We then enjoyed visiting some of the most beautiful underground stations I've ever seen, all murals and mosaic artworks, that are in such pristine condition they're part of a collection and treated as public museum. We went on to visit a convent and drove around the sights before enjoying dinner at the Poet's Club, an old noble family's home. On the morning of day three, breakfast was at leisure before we were transferred to Moscow's main train station, enjoying a Russian champagne reception before being escorted to our carriages to settle in before the real adventure began. The full train comprises 12 en-suite Silver and Gold Class sleeping cars, which feature state of the art amenities such as power showers, underfloor heating, a DVD/CD player, LCD screen and individually-controlled air-conditioning. 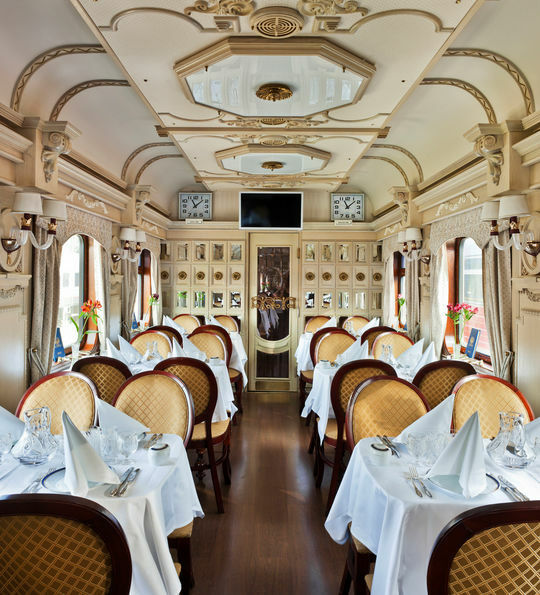 A particular delight of the Golden Eagle was the beautifully appointed restaurant car, where chefs served local delights such as borscht and omul – a fish unique to the famous Lake Baikal. It really was a culinary experience that represented the very essence of Russia, accompanied by – naturally – ice-cold vodka. The social heart of the train throughout was the bar car; it was such a great place to relax and settle into the unhurried pace of life on board. I took the chance to unwind in the ultra-comfortable surroundings and watch the world go by as I got to know my fellow passengers, enjoying the gentle hum of the pianist – and the bar stays open until the last person leaves! After settling into our modern, stylish cabins, we enjoyed dinner in one of the beautifully designed restaurant cars as our rail journey to Almaty in Kazakhstan began. 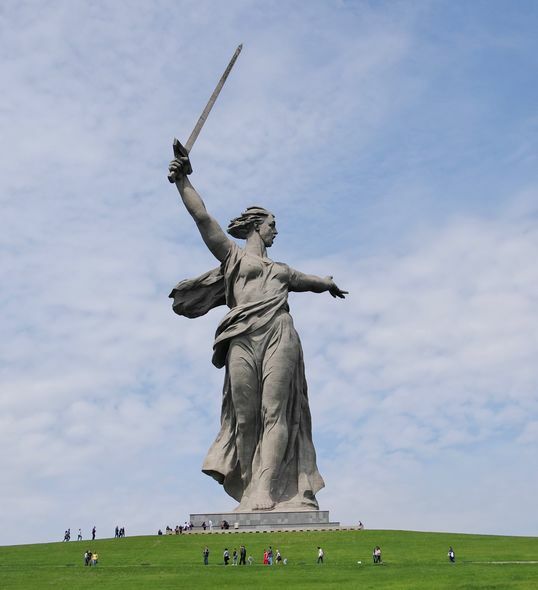 Standing on the banks of the Volga, Stalingrad, as the city was known in Soviet times, was the dramatic scene of some the most important Second World War battles. The day's highlights were definitely the poignant and sobering Mamayev Kurgan war memorial, as well as the fascinating Changing of the Guards ceremony. 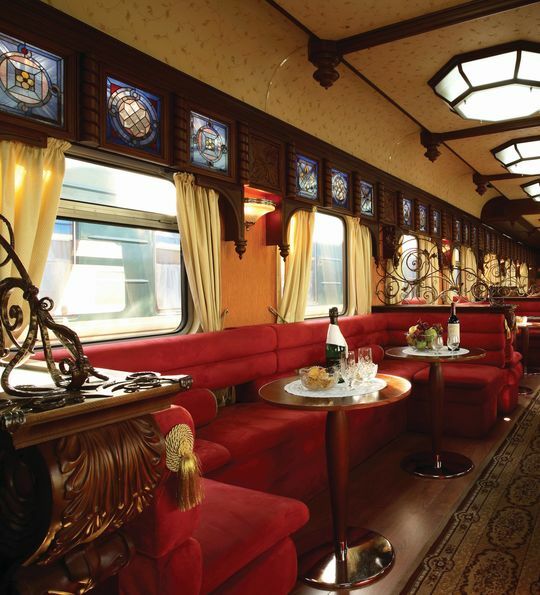 In the evening we indulged in a beautifully prepared dinner on board our private train, then on day five, we enjoyed a relaxing day onboard as we travelled across the vast expanses of the Kara Kum desert. As well as experiencing the unique landscape, it was nice to relax and enjoy the passing scenes that consisted mainly of dry, flat, desert-like landscapes. Crossing into Uzbekistan, our train travelled towards Urgench, where we transferred to the ancient city of Khiva that was founded 2,500 years ago. 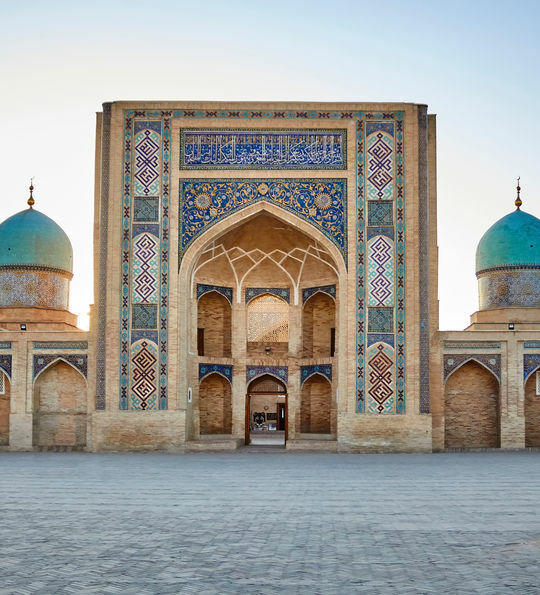 As one of the Silk Road's most important trading posts and now a World Heritage Site, it lies at the crossroads of the routes between Mongolia, Russia, China and Persia. A truly magnificent sight to behold, it rises out of the desert to reveal a wealth of impressive architecture, and we discovered its impressive mosques, bazaars and minarets within ancient walls before a delicious lunch and dinner was served onboard the train. A highlight was the intricate hand-painted artwork and mosaics on ceilings and walls, as well as a local family treating us to a tea in a teahouse alongside an array of local sweet delicacies. We had an early wake-up call the next morning and left before sunrise, being transferred in old Russian trucks to visit ‘The Door to Hell', otherwise known as the Burning Gas Crater. In 1971, geologists were conducting gas drilling in the Kara Kum desert and discovered an underground chamber that resulted in the drilling rig collapsing, leaving a giant crater filled with poisonous gas exposed to the outside world before a suggestion to light the gas to burn off the poisonous vapour. It has been on fire since then due to the infinite supply of natural gas, and was an eerie but beautiful sight, particularly as we watched the sun rise. In dramatic contrast to Khiva, we arrived in Ashgabat, the capital of Turkmenistan – the ‘Las Vegas of the Kara Kum'. Situated between the Kara Kum Desert and the Kopet Dag mountain range, its golden domes and towering modern buildings appeared strangely incongruous in this almost biblical setting. Early morning saw us arrive in Mary, where we transferred to the ancient and mainly unrestored city of Merv. Once an important stopping point on the Silk Road, it claims to have briefly been the largest city in the world during the 12th century. The next day we arrived in Bukhara, quite simply an outstanding city, and, like Khiva, UNESCO-restored. A visit to The Ark, a fortified residence of the Emirs of Bukhara – the despotic and ruthless leaders who ruled until Soviet times, was a highlight, as well as a visit to Emir's enchantingly-named Palace of the Moon and Stars. The architecture was stunning and we all enjoyed shopping for carpets, pashminas and colourful local fabrics. 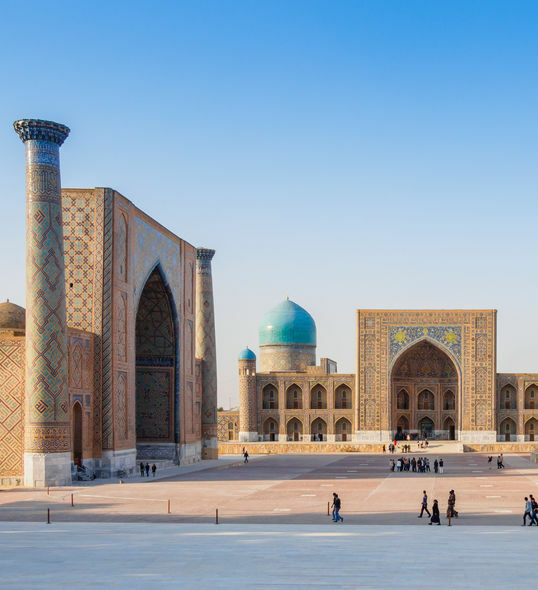 Founded in the 6th century BC, Samarkland's stunning architecture hints at its former status as one of the most important cities in Asia. Today we visited some of its most significant sites, including the refined elegance of the beautiful Bibi Khanum Mosque and the Ulag Beg observatory, one of the earliest Islamic astronomical observatories built in 1428. Before dinner in a local restaurant we visited the awe-inspiring Registan Square before returning to our train for a late evening departure, but I could easily have spent a week there to enjoy its beautiful mosques and fine artwork. I particularly enjoyed the local food market which specialised in dried fruit and fresh herbs as well as a light and sound show at the Registan Square, followed by a dinner in a local restaurant. Today we arrived in the capital city of Uzbekistan, Tashkent, and spent the morning touring this modern Soviet-style city, which was rebuilt following the devastating earthquake of 1966. 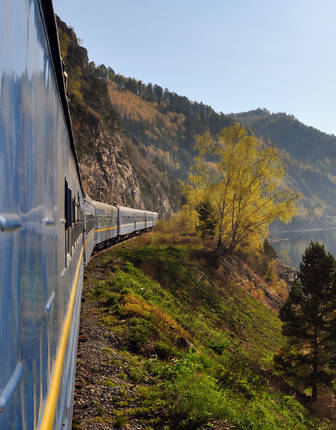 We re-boarded the train for lunch as we headed towards Kazakhstan and Almaty, then this afternoon I relaxed and listened to one of the informative lectures that gave me a great insight into this fascinating region. Then, we visited a train museum featuring some very old steam train engines, before enjoying our final evening on board the Golden Eagle. Just before lunch we arrived in Almaty – the largest city in Kazakhstan. This beautifully verdant city's name derives from ‘Alma', meaning 'apple', and, sure enough, just a short distance from the city, apple orchards thrive in abundance. Tonight we transferred from the Golden Eagle to the lovely five-star InterContinental Hotel for a one-night stay before transferring to the airport for my flight home. 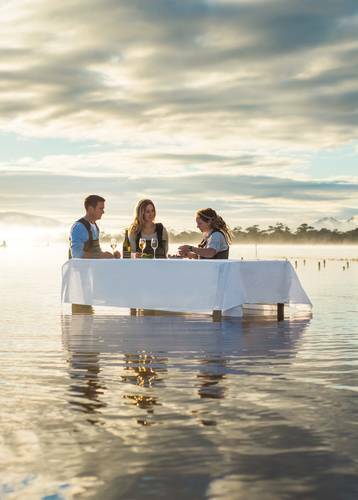 This was truly a private journey full of wonderful adventure and experiences. 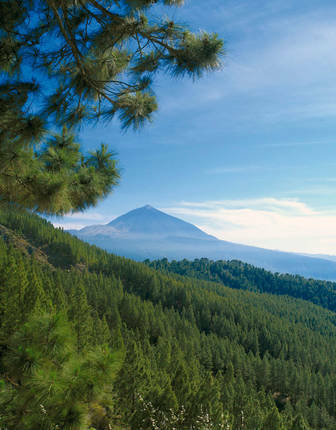 The destinations covered are not easily accessible due to lack of infrastructure between places and so this journey provides the comfort, convenience, adventure, experience and a sense of safety. This is definitely one for those who are looking for something unique and have interests in discovering the Silk Road's culture and history. Breakfast served on the train was fantastic, with a great selection of cold items including cheese, salmon, salads, yoghurt, freshly squeezed orange juice and excellent omelettes. Lunch normally came with a choice of two starters (one meat and one vegetarian), with a sandwich or a soup for main followed by dessert, tea and coffee. Dinner was three courses with choice of two dishes for starter and main and it was all local cuisine where possible. A fresh fruit bowl in each carriage is replenished daily and there is a good selection of white and red wine, soft drinks, beers and bottled water which is complimentary with meals. If you're in a Gold Class cabin, then a standard list of alcoholic beverages are also included. The staff spoke very little English but were extremely friendly and professional. Tea and coffee was always available in my cabin and there was a 24-hour attendant in each carriage to look after the guests. A laundry service is available at a charge; it can take up to three full days to come back but this doesn't matter too much if you're on the train for an extended period of time. Excursions were very well executed and in small groups of 25 to 30 guests with an audio vox system. Each guest was given an earpiece for the trip, local guides speak good English and transport is surprisingly modern and very comfortable. They were well designed to suit the purpose; small but comfortable and clean. There was a nightly turndown service and cabin service each morning and there are little spaces and shelves for storing clothing, with a small hanging wardrobe and in-cabin safe. Your luggage is stored at the end of each carriage and you can unpack only what you need – the rest is stored in your luggage and is easily accessible.